The Skeptical Environmentalist Is... No Longer Skeptical? The world's most high-profile climate change sceptic is to declare that global warming is "undoubtedly one of the chief concerns facing the world today" and "a challenge humanity must confront", in an apparent U-turn that will give a huge boost to the embattled environmental lobby. 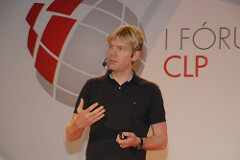 Bjørn Lomborg, the self-styled "sceptical environmentalist" once compared to Adolf Hitler by the UN's climate chief, is famous for attacking climate scientists, campaigners, the media and others for exaggerating the rate of global warming and its effects on humans, and the costly waste of policies to stop the problem. But in a new book to be published next month, Lomborg will call for tens of billions of dollars a year to be invested in tackling climate change. "Investing $100bn annually would mean that we could essentially resolve the climate change problem by the end of this century," the book concludes. What gives? Did Lomborg genuinely have a change of heart? Or is he just trying to figure out a new way to sell books? After all, now that the prospects for a global effort to tackle climate change look dim, the green position is ripe ground for self-styled contrarians.